Our dogs and us live in a small town in “the Knüllwald”, which is located in the middle of Germany. Surrounded by forest, meadows, and fields, this beautiful area is a perfect environment for dogs. You can find us in the northern area of the State of “Hessen”, and about 35 kilometers south of Kassel. Terriers have been the center of our lives for over 25 years. ‘West Highland White Terriers’ were our first love but since they are ideal companions, we have continued our lives with Scottish Terriers. It was in 1995 that we started to operate a registered kennel as members of the Club for Terriers (Klub für Terrier (KfT)) under the organization of the VDH, which requires in breeding purebred Terriers that the guidelines of the KfT’s breeding regulations are being strictly maintained. 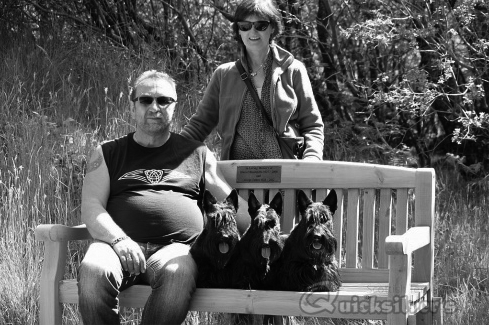 We are also members of the “Förderverein for Scottish Terrier Germany” and the “Austrian Club for Terriers”. Our goal in breeding Terriers is foremost to raise healthy, strong puppies with outstanding social skills. Our puppies grow up with abundance of human contact and attention, plenty of access to nature and the outdoors. We make daily efforts for them to thrive and develop their personalities. They live in the house with us, receiving lots of nurturing. In their puppy room they are learning to explore early on in their little lives presented with special toys and equipment that furthers their natural curiosity, bravery, and coordination. They also get to enjoy a large garden and daily outdoor playtime, as soon as they are old enough. 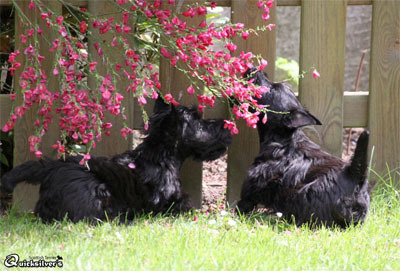 In our pursuit to raise excellent, well-adjusted Scottish terriers, we pride ourselves in providing the best of care, combined with professional trimming, which the “little ones” experience early on and get accustomed to. Our kennel also offers expert trimming for wire-haired Terriers and Schnauzers for pets and show dogs in our private Trimming Salon. In our free time we like to participate in national and international dog shows in and outside of Germany to compete against other Terriers. We had to earn our stripes in the beginning, however, by now, we are proud to look back on a long string of successes with our dogs in the show ring. Our dogs have received titles as champions of the KfT and VDH, we collected awards like “European Youth Winner”, “Club Junior Winner”, “Federal Junior Winner”, “European Winner”, “Club Winner”, “National Winner” and “International Beauty Champion”. Through their accomplishments they have also collected coveted titles such as “Best of Breed” (BOB) and “Best in Show” (BIS) at several exhibitions. 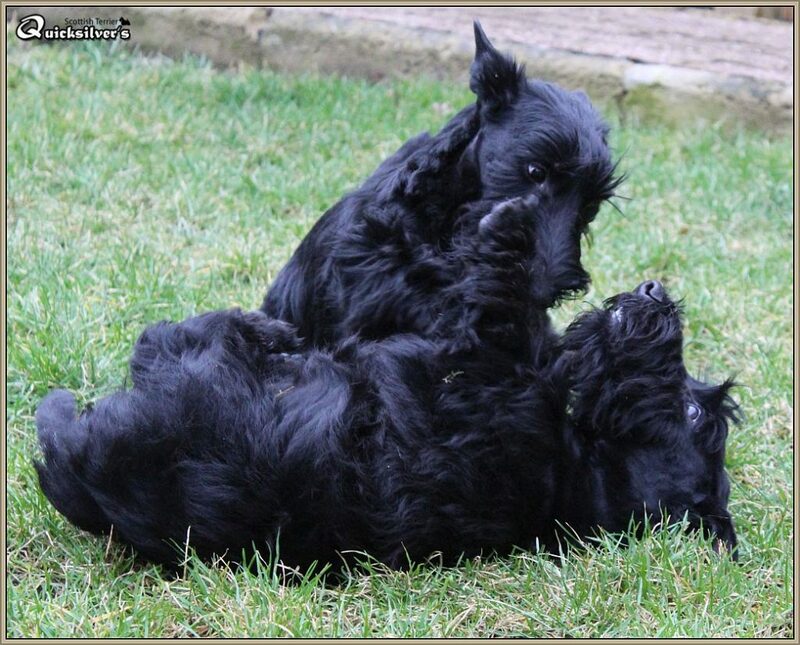 If you would like to continue reading and find out more, please go to the tab “Our Scotties,” we have also listed the individual accomplishments in each dog’s personal page. Thank you so much for your interest and taking the time to visit with our dogs. In closing, we would simply like to say that we have devoted our lives to our Terriers, and raising outstanding pups is our passion and a way of life for us. It is our desire and goal to continue to deliver wonderful puppies to clients, who appreciate them and want to live with a well-developed and balanced dog, who will be a joy to live with and a family member for many years to come. If you would like to know more about our breeding program or are interested in acquiring a puppy, please feel free to contact us. It was our expectation and our goal to breed Terriers according to the international breed quality requirements of the FCI as our standard, which meant for us to become members of the Club for Terriers in Germany (KfT). The KfT supervises by now 29 terrier breeds, and functions under the parent organization of the “Club for German Dog in breed and Show” (VDH) and thus as well under the FCI, a club with a long-standing tradition, founded in 1894. We appreciate and subscribe to the guidelines of this organization. In our opinion it comes the closest in pursuing the ideal of breeding the perfect Terrier and always striving to improve the quality of the dogs. The breeding guidelines and requirements are laid out clearly so there are no misunderstandings for any dog to meet the requirements of acquiring a breeding licence. Our puppies must be at least 10 weeks old, and will be dewormed, vaccinated and micro-chipped, before they are allowed to continue their new lives in their new homes. They also will receive a complete check-up from our veterinarian and will be inspected by the breeding steward of the KfT. Every puppy will be accompanied by a purchase contract, an EU pet passport, her/his favorite toy, and a collar and a leash, and some food for the journey to her/his new home. The VDH pedigree will be sent to the new owner free of charge, as soon as it has been issued by the Club, which sometimes is after the puppy has moved to her/his new home. If you are interested in one of our puppies, please do not hesitate to contact us early on as we tend to have a waiting list. We would like to get to know the future potential owners of our puppies as early as possible and provide them with the opportunity to prepare themselves for the new family member. This also allows us to discuss with you, which puppy suits you, your lifestyle, and home best. Please know, we do support and assist our dogs and their owners throughout the dog’s life. We are happy to advise on dog care, trimming, education, and nutrition of your new family member.